Wrap a few Hershey’s chocolate kisses in a circle of green or white tulle, tie with ribbon and add free printable labels to give out on St. Patrick’s Day. To print one label, right click, then select “view image”, “file” from your computer menu, and “print”. Or print this page to get all four. Punch a hole in a corner of each label, thread with ribbon, and tie around the tulle and kisses. These little packages also make great party favors or placeholders for St. Patrick’s dinner. 1. Place 3 to 5 Hershey’s kisses in the center of a tulle circle or add to a clear plastic baggie. If using the baggie, you can also add a small amount of green glitter or St. Patrick’s day confetti. 2. Gather up the tulle or baggie and secure with a narrow ribbon just above the chocolate kisses. 3. 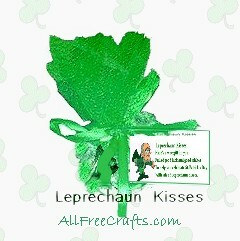 If desired, copy one of our Leprechaun Kisses Poem labels to your computer, print and cut out (or print the entire page). Punch a hole in the left corner of the label and thread it onto the ribbon before tying in place. AllFreeCrafts.com has provided original free crafts, craft projects and patterns to make easy homemade gifts since 2002. Find crochet, knitting and sewing patterns; free Christmas, Halloween, Easter and holiday crafts; plus nature crafts, gardening, recycling ideas and more. To share my work on your site, use only one image and a short description, with a link to the original page. Thanks!